For nearly 50 years, Texans have gathered at the UTSA Institute of Texan Cultures on the second weekend of June, wearing their kilts, buckskins, kimonos, sarapes, 1800s uniforms, blacksmith aprons and grass skirts. They come from dozens of cultures that have made Texas their home, and they have brought their traditions with them. This year, they will convene again, June 7 – 9, at the UTSA Institute of Texan Cultures, to celebrate the Texas Folklife Festival. The Texas Folklife Festival brings the Institute of Texan Cultures exhibit floor to life, with the customs described in the cultural exhibits embodied in the descendants and community members of those cultures that settled in Texas generations ago. Outside on the institute’s 14 acres, the groups perform their music and dance on five stages. At their food booths, they add unique ethnic dishes to a menu teeming with savory and sweet delights, from Lebanese shish kebab, to crispy Belgian waffles. Today’s Texans keep alive the skills and crafts that helped the early pioneers establish their homes in this inhospitable region. Blacksmiths gather at their forges and anvils. Woodworkers take up their tools and begin to carve. Jelly makers heat their pots and start the next batch to preserve the fruits of the season. Dutch oven cooks stoke their fires to start on the next meal. Most festival participants, including the dance groups and artisans, offer audience participation and hands-on opportunities so guests can learn by experience. 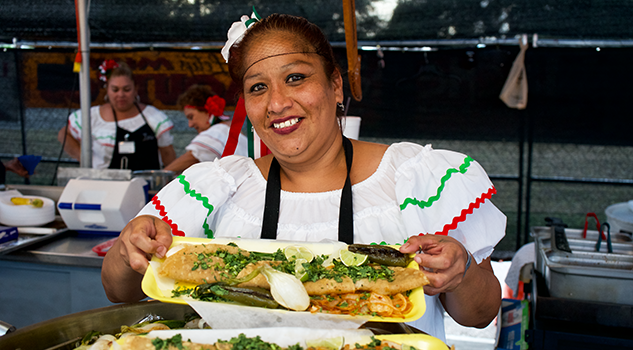 The Texas Folklife Festival is June 7 – 8 at the UTSA Institute of Texan Cultures. The festival expects some 250 participant groups, representing more than 40 cultures, with entertainment on five stages, more than 60 skilled artisans demonstrating their trades, and a menu of more than 150 authentic offerings. The Institute of Texan Cultures is at 801 E. Cesar E. Chavez Blvd. For more information, call 210-458-2300 or visit TexasFolklifeFestival.org.